Martin ELP CL (Colour) LED ellipsoid fixtures deliver the class-leading luminance, output and vivid colour rendering that you’ve come to expect from Martin. Ergonomic Danish engineering offers advances in lighting functionality that include the highly efficient gear-based Fine Focus - an industry first; and Fast Focus which allows focusing of the fixture without data flowing to it. ELP also offers 16-bit dimming with 4 selectable curves and 26 colour presets that match industry-standard colour filters. ELP fixtures can be configured with one of four Martin lens tubes in 19, 26, 36 and 50-degree beam angles and are compatible with third-party lens tubes along with a wide range of accessories including gel frames and gobos for flexibility in lighting design and inventory management. 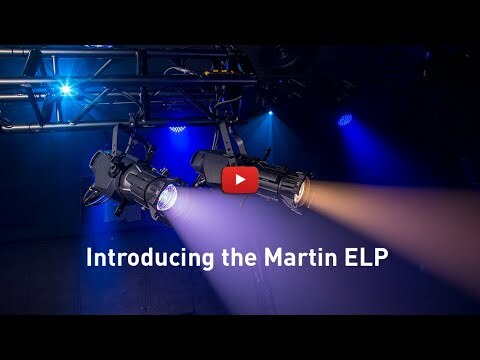 Superior output, optics and colour rendering, combined with unparalleled ease-of-use and convenience, make Martin ELP the leading LED ellipsoidal fixture in its class. Martin ELP Ellipsoids feature optic assemblies designed in Denmark by the technology innovators behind MAC Encore, the leading LED moving light. The ELP is designed to maximize efficiency and deliver a flat field of illumination for smoother blending and mixing between fixtures. The ELP CL fixture offers an impressive 6,900 lumens and a CRI of 85 in High Output mode, and 5,900 lumens and 90 CRI in High Quality mode, with a colour temperature of 6,000K (open white). Both models offer flicker-free operation for consistent light output, on and off camera. ELP takes a classic light fixture to new performance levels. Our gearbased Fine Focus adjustment—an industry first—lets you lock focus exactly where you want it, instantly. There’s no refocusing, no drifting and no slipping. Fast Focus brings the fixture to full output for 60 seconds - meaning you can focus without data running to the fixture. Halation Colour correction removes atypical blue and brown halos when using Martin lens tubes. Fixtures offer 16-bit dimming with 4 selectable curves. Danish engineering is all about efficiency and ergonomics, and the subtle details of ELP are no exception: We’ve placed the center of gravity as close to the yoke as possible, for more comfortable operation. And, we’ve placed tilt knobs out of the way of framing shutters, to allow quick, easy position adjustments. It’s never been easier to transition your inventory to LED ellipsoids: The ELP line offers four lens tube configurations but also fits common lens tubes and accessories, which means you can save money by using your existing gel frames, gobo holders and rotators and lens tubes. Class-leading output rating of 6,900 lumens (in High Output mode). CRI rating of 90 (in High Quality mode). Industry’s first gear-driven Fine Focus, Fast Focus for data-free focusing, and more. Use existing lens tubes, gel frames, gobo holders and rotators.